Happy Taco Tuesday! You'd think with all the tacos we consume in our house that we wouldn't ever go out for Mexican food... but we do! Little Man has hopped on the bandwagon and will request Taco Mama, Casa Blanca or Little Rosie's for restaurant options if we are dining out :) I think he might like Mexican food just as much as his daddy - if Parker knows it's Taco Night, he'll tell anyone he sees. 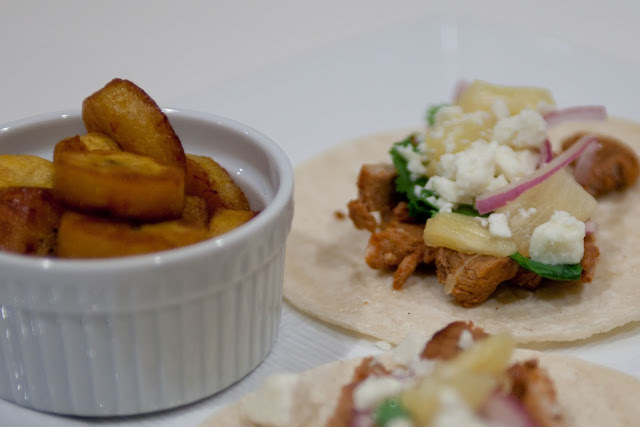 Our last Taco Night was a new-to-me recipe for Pineapple Pork Tacos, found in the August 2015 issue of Real Simple magazine. 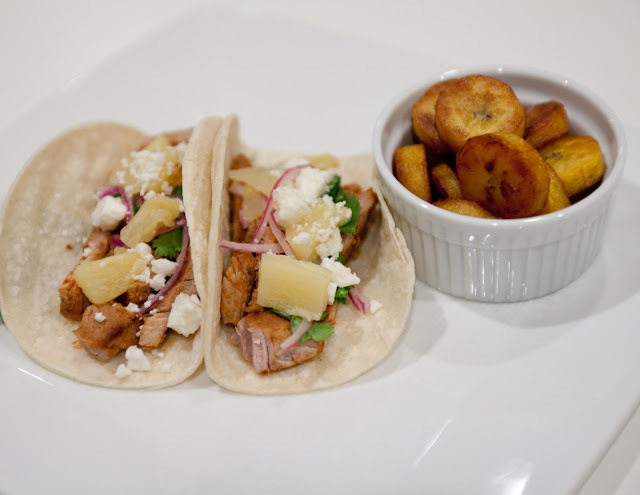 I like the twist of using pineapple in the tacos, and I added a side of fried plantains to keep with the fruit theme. These tacos were scrumptious - and the flavor profile was very different from most anything I cook. I definitely remember complaining that we didn't have any leftovers, so I might double this recipe the next time I make it! Combine 1/2 cup pineapple juice, chili powder, pork, and jalapeño slices in a large ziplock bag. Refrigerate 1-4 hours. Remove the pork, discard liquid, and cook pork in canola oil over medium high heat (3-4 minutes per side). Thinly slice and stuff into warmed tortillas. Top with pineapple chunks, onion, cilantro, and feta. Melt butter in a ceramic non-stick skillet on medium high. Brown both sides of plantain slices, then turn heat down to continue cooking the plantains (five-ish minutes). Season with a pinch of salt. I recently discovered how amazing pineapple is one things from tacos to pizza to omelets. I'm going to pin this for our menu later this month.